Are the weights and coding of Ventile® fabric a mystery to you? Is L35, L34, L19 or L24 best for your garment use? Why doesn't Hilltrek use L28? What is Organic Ventile? In this article, we'll try to throw some light on these questions. Ventile® fabric is available in a wide range of fabric weights and specifications. Although most fabric types have the same technical performance so far as water repellency, hydrostatic head and water vapour permeability are concerned, the fabrics vary significantly in weight, where heavier fabrics have thicker threads and therefore better tear and breaking strengths. The different specifications are given codes, all beginning with the letter 'L' and then two numbers - we use L24, L19, L34 and L35 across our garments. Confusingly, the numbers have no relationship to the fabric weight or specification, so while L19 is heavier than L24, L28 is heavier still. Most of our garments are available in L24. L24 has the optimum specification for technical clothing in terms of weight and toughness, it has the greatest selection of colours and also the lowest price per metre, yielding the best value for our customers. Some garments are available in the heavier L19 fabric, such as the Liathach Cotton Analogy and Cruachan Double Ventile Smock. However, while the heavier fabric has better tear and breaking strength, the downside is that it will inevitably be less flexible, which may compormise the hang of the garment and impact on the type of use. While this is an accceptable tradeoff for garments where the wearer is not that active, we don't use L19 for trousers and other garments where maximum flexibility is vital. Weight is another consideration - an L19 garment is approximately 18% heavier than the same item made in L24. For lighter weight garments where flexibility is more important than extreme toughness, we use L34 or L35 fabric. Both fabrics are lighter in weight and more supple than L24 and have the same performance in terms of waterproofness and breathability. 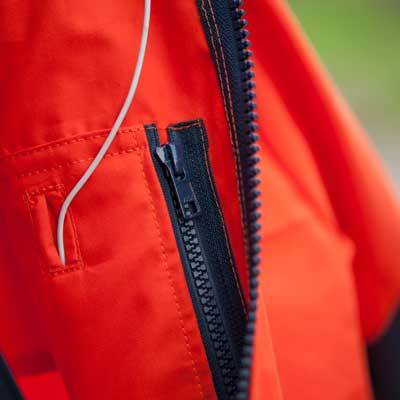 Our shirts, and windproof garments such as our Greenspot Single Ventile Jacket, are made from L34. We are introducing L35 versions of our shirts and smocks. Why don't we use L28? L28 is tougher than the other Ventile® fabrics - so why don't we use it in our standard garments? The main reason comes down to weight - our Cruachan Double Ventile Smock in L28 would weigh over two kilos, 50% heavier than in L24, which would be unacceptable for most users. Further, although L28 has marginally better breathability and waterproofness (hydrostatic head) than L24, it is a stiff fabric, not ideal for our technical clothing in our opinion, and it is more expensive. Rough guide to converting Ventile® garment weights. We are often asked what the weight of a standard Hilltrek garment would be in another Ventile fabric, so we have compiled a table to assist. This is a rough guide only: fabric weights are only specified to within 5%, and zips, cords, fasteners etc. are not taken into account. For example a medium Cruachan DV Smock weighs approx 1.4 kg in L24 therefore in L19 it weighs 18% more i.e. 1.65 kg. For Cotton Analogy the conversion is not so straight forward because only the outer garment is made of Ventile®. As a very rough guide apply the conversion to 50% of the garment weight. If this article has whetted your apetite for more information about Ventile®, here are the detailed Ventile Fabric specifications. Happy reading!